Advanced heavy lifting technology being introduced to Australasia by the global Enerpac organisation was employed in the UK recently in the precision raising and positioning of sections of the hulls of new destroyers being manufactured for the Royal Navy. Each ship's hull is manufactured in sections or blocks in a fabrication shop adjacent to the berth and slipway. Five blocks of up to 1400 tons are moved to build one ship. The same technology is being used in Australasian heavy lifts, such as precisely splitting a giant mining dragline for maintenance and hoisting bridges and structures for maintenance. Tony Cooper, who has been involved in Australia’s synchronous lifts, explains how the technology was used in the warship raising and its advantages for local use. Six Daring Class Type 45 anti-air warfare destroyers are being assembled, launched and outfitted for the Royal Navy at BAE Systems Surface Fleet Solutions' Govan & Scotstoun shipyards in Glasgow. These destroyers will have an overall length of 152.4m, space for a crew of 235, a displacement of 7350 tons, a top speed greater than 27 knots and a range greater than 7000 nautical miles. The first one is HMS Daring and is to enter service in May 2009. The ship's hull is manufactured in sections or blocks in a fabrication shop adjacent to the berth and slipway. Five blocks are moved in total to build one ship of which the heaviest block weighs over 1400 tons. Each block is transported to the slipway and aligned longitudinally to the slipway on multi-wheeled transportation vehicles. During this procedure the slide-tracks on the slipway are removed so that the vehicles can drive the blocks into position. The Enerpac Synchronous Lifting System is now used to lift the block free from the transport so that they can be driven away. During the lifting procedure, a 16-point PLC-controlled synchronous lifting system operates within strict load and stroke constraints to ensure that the desired load paths into the ship's hull structure are maintained. With the transport removed and the hull segments supported by the hydraulic system, the blocks are weighed with the synchronous lifting system to confirm the design calculations. The next step is the slide-track installation. The slide-tracks on the berth's slipway can then be re-installed. The block is lowered synchronously and the load is transferred on to the slide-tracks. The hydraulic lifting system permits the manipulation of the blocks prior to welding to the adjoining section. This manipulation - lifting, lowering and rotation - is a PLC-controlled hydraulic movement. In the use of hydraulics for heavy lifting projects, application knowledge and expertise are very important. Accurate lifting, lowering, pushing or weighing has a significant effect on structures. Accurate manual control and monitoring is complex and time consuming. And more - accuracy is more important than speed - the advantage of PLC controlled integrated hydraulic systems is enormous. Every step of the lifting process can be monitored via the display of the PLC control unit. Apart from the very accurate and stress-free movement of steel structures, concrete segments, etc. Enerpac provides a safe, easy to manage, cost- and labour-saving solution. The Type 45's weight must be optimised and consequently the hull skin is relatively thin when compared with a commercial ship. Therefore when lifting and lowering, the load paths must be strictly controlled and this would be almost impossible with manually controlled systems. Controlled hydraulic movement brings safety to the structure. The second advantage is the increase of productivity where hundreds of man hours were saved against traditionally controlled lifting methods. 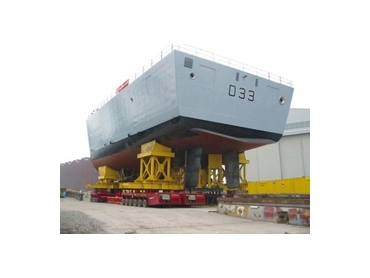 Moreover, this versatile lifting system is employed on various other lifting and weighing operations around the shipyard. The precision and safety of the Synchronous lifting and positioning further demonstrated the benefits for which Synchronous Lifting Systems are being used in Australiasia. A major benefit is load balancing and removal of internal stresses. With manual control, differences arising between the lifting points are unavoidable, because measurement of the movement and control of the lifting points are never optimal. Internal stresses resulting can ultimately cause hidden damage compromising serviceability and safety. Synchronous lifting offers users significant advantages over manual control, including safety, considerable time savings and virtually no internal stress in the object, helping to obviate potential problems arising later. The first versions of Enerpac’s Synchronous Lifting Systems employed Down Under have already demonstrated their prodigious lifting ability on tasks where safety and precision were at a premium, including splitting of a 3,500-tonne dragline at Curragh in Queensland for maintenance and lifting of bridges for repair. The have also been used in the construction of a high bridge, the 343 metre high Millau Viaduct in France (which is twice as high as the Sydney Harbour Bridge), and the construction of North Sea oil rigs). Available in configurations from 4-64 lifting points, synchronous lifting systems electronically control and monitor movement during the hydraulic raising, lowering, positioning or testing of very heavy objects such as manufacturing machinery, motors, manufactured structures, buildings, bridges, oil platforms, ships, turbines, generators, mills, mining equipment and heavy but delicate computerised/electrical equipment. The Premium version of Enerpac’s computer-controlled Enerpac synchronous hydraulic lifting system can be used with multiple cylinders ranging from 10-1000 tonnes capacity each. This system – detailed in Enerpac’s Australasian E325A catalogue - uses digital synchronisation control accurate to within a 0.1 millimetre between leading and lagging lifting points. Operating through PLC control with touch-screen simplicity, the 700-bar system offers maximum stroke to finely balance complex and sometimes delicate and potentially hazardous structures.